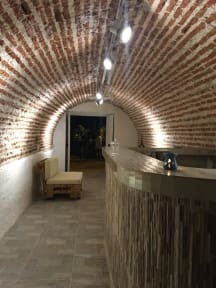 El Arsenal Hostel Boutique i Cartagena, Colombia: Bestill nå! The area is very good, close to the attractions and also restaurants. The rooms are very good and a/c perfect. The pool is perfect for Cartagena temperature. The staff is extremely helpful and nice. The bed - bathroom ratio is good but I wish they had hooks in/by the shower. It's a bit on the pricy side but definitely worth it, it's a quality hostel. The hostel it self was nice, though few places to sit down and eat in the morning. Good location. The staff members are grumpy, unfriendly and not willing to give any service. When delivering our clothes to laundry service we received them unfolded and stuffed in a tiny plastic bag.